Greenhouse farms in Russia require a lot of energy to heat them in winter. Japanese investment will help increase the local production of vegetables in the eastern Siberian republic of Yakutia and the city of Khabarovsk in Russia’s Far East, where the main source of out-of-season vegetables is currently imports from China. Under the contract, Hokkaido Corporation has also supplied technologies and equipment from Japan for the construction of the greenhouse farm. In particular, the Japanese equipment is responsible for the computerized management of the microclimate and regular delivery of fertilizers with manual labor reduced to a minimum, the Sauri press release said. All the vegetables will be sold on the domestic market in Yakutia. “So far, the main foreign supplier of vegetables to the Yakutian market has been China, and there is no competition in the production of tomatoes, cucumbers or lettuce,” Maxim Sleptsov explained. Yet, even with Chinese supplies factored in, vegetable consumption in Yakutia is below the recommended norm due to the lack of good-quality vegetables, he continued. According to Sleptsov, Sauri’s production will meet 14.3 percent of the region’s demand for tomatoes, 51.3 percent of demand for cucumbers, and 7.4 percent for lettuce and various herbs. Another example of Japanese investment in the greenhouse business in the Russian Far East is the JGC Evergreen company, which has for more than a year now been growing tomatoes and cucumbers in an advanced development territory outside Khabarovsk. The amount of investment in the project has been reported at over 2 billion rubles (over $30 million). “Next year, we are planning to double the capacity of our [greenhouse] complex in the Khabarovsk Territory. We have already felt that there is very high demand in Russia for good-quality domestically-grown vegetables,” JGC Evergreen executive director Tomoyuki Igarashi told RBTH. The company currently produces 1,000 tons of tomatoes and cucumbers a year and, according to Igarashi, accounts for about 10 percent of the vegetable market in Khabarovsk. Greenhouse farms in Russia require a lot of energy to heat them in winter. Yet, according to Igarashi, the greenhouse business in Russia is economically attractive thanks to the cheap gas, which makes production more cost-effective. “Our expenditure on gas in Russia is a fifth of the amount spent in Japan,” he explained. The expansion of JGC Evergreen’s business is closely related to plans for the construction of a logistics center in the industrial park where the greenhouse farm is situated. Once the logistics center has been built, JGC Evergreen plans to use it to install cold chambers for long-term storage of various varieties of vegetables. “Japan has advanced technologies about cold chamber. Therefore I would like to introduce such technology to Russia,” said Igarashi. Lack of domestically grown vegetables and large volumes of imports from China as well as attractive preferential terms offered to residents of an advanced development territory in the Far East were the decisive factors for Russian investors to invest in the establishment of the Green Farm greenhouse complex in the Kamchatka Territory. 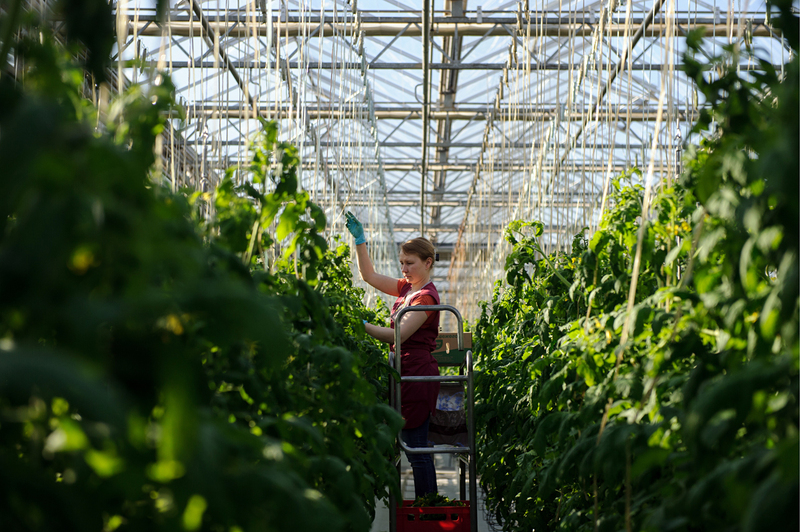 By 2017, a greenhouse farm on an area of 4.8 hectares is planned to be built outside Petropavlovsk-Kamchatsky to grow tomatoes, cucumbers, lettuce and other herbs, the company’s director Andrei Abikh told RBTH. Initially, Green Farm management considered the option of heating the greenhouses with the hot springs that Kamchatka is famous for. However, that idea had to be abandoned because of high economic and environmental costs, Abikh explained. Natural gas turned out to be a more cost-effective, energy-efficient and stable solution, he added. According to Abikh’s estimates, local vegetable production in Kamchatka Territory does not exceed 15 percent of consumption, with the remaining 85 percent made up of imports from China. “The implementation of our project will make it possible to increase the share of domestic production of greenhouse vegetables to 35 percent, primarily replacing imports,” said Abikh.